I absolutely love Winter Restaurant Week. It always starts at the end of January and completely saves me from my first "Sunday without football" blues. Okay I guess the Pro Bowl was on this past weekend but I don;t think I've ever watched that. 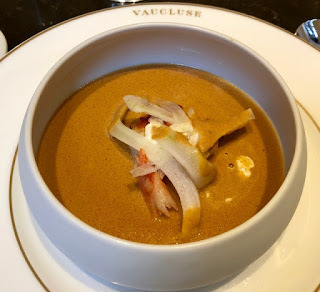 This year I decided to head uptown to Vaucluse, the beautiful French restaurant that took over the Park Avenue Winter space a few years back. I love the interior of this restaurant; everything is so comfortable and elegant with big fluffy white banquettes lining the walls and crisp linen cloths on each table. 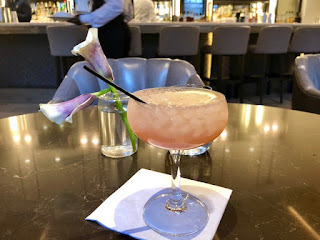 I was dining solo so I opted to sit in the beautiful bar room to sip on my cocktail and listen to the jazz trio serenading the brunch crowd. 1st Course Lobster Bisque~ Three meaty chunks of lobster and crab enrobed in a silky lobster broth, poured table-side, with tarragon and creme fraiche. This soup was phenomenal. I could taste all the big, bold flavors of the ocean without that heavy cream that can weigh down most bisques. 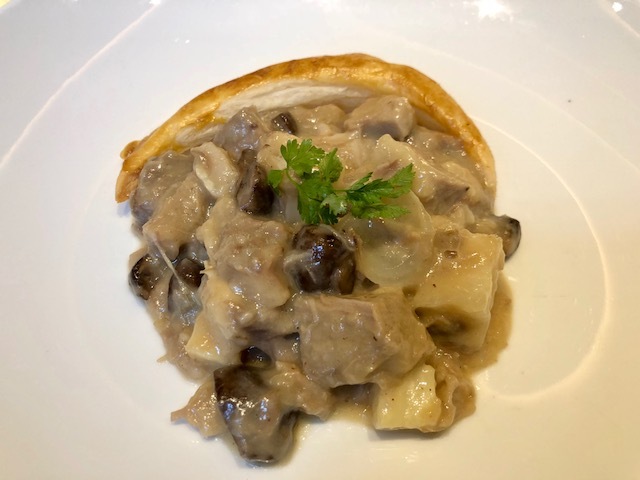 2nd Course Blanquette de Veau~ Braised veal with celery root, pearl onions and puff pastry. I had envisioned a Veal Wellington when I ordered this dish, somehow ignoring the big "Blanquette" on the menu which obviously indicated a stew. Luckily it was a delicious mistake; the nuggets of veal so tender I never once picked up my knife. 3rd Course Vanilla Bavarois~ almond sponge cake and orange with basil citron ice cream. 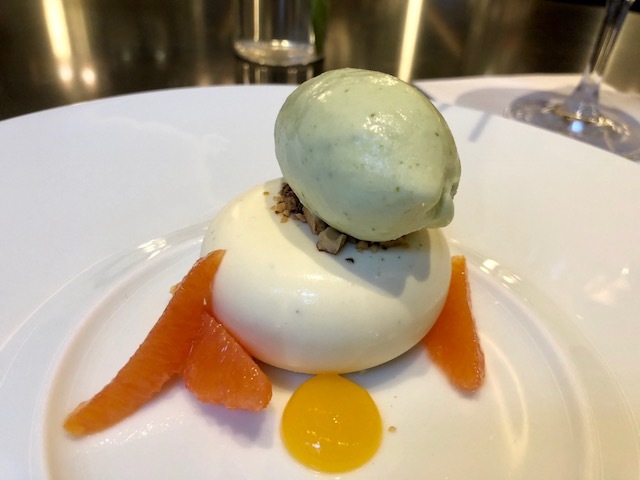 This dessert was a light and refreshing end to the meal, my only small quibble being the bavarois was served much too cold. I had to let the inside thaw for a few minutes to really taste that wonderful vanilla bean flavor. This was an incredible lunch for just $29; so fantastic I'm hoping to fit in one more meal before Restaurant Week ends next month.